As the chief human rights official of the Clinton Administration, John Shattuck faced far-flung challenges. Disasters were exploding simultaneously--genocide in Rwanda and Bosnia, murder and atrocities in Haiti, repression in China, brutal ethnic wars, and failed states in other parts of the world. But America was mired in conflicting priorities and was reluctant to act. What were Shattuck and his allies to do? This is the story of their struggle inside the U.S. government over how to respond. Shattuck tells what was tried and what was learned as he and other human rights hawks worked to change the Clinton Administration's human rights policy from disengagement to saving lives and bringing war criminals to justice. He records his frustrations and disappointments, as well as the successes achieved in moving human rights to the center of U.S. foreign policy. Shattuck was at the heart of the action. He was the first official to interview the survivors of Srebrenica. He confronted Milosevic in Belgrade. He was a key player in bringing the leaders of genocide in Bosnia and Rwanda to justice. He pushed from the inside for an American response to the crisis of the Haitian boat people. He pressed for the release of political prisoners in China. His book is both an insider's account and a detailed prescription for preventing such wars in the future. Shattuck criticizes the Bush Administration's approach, which he says undermines human rights at home and around the world. He argues that human rights wars are breeding grounds for terrorism. 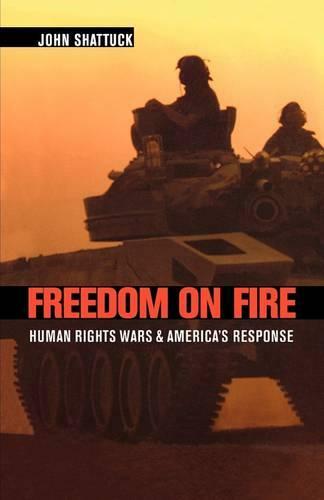 Freedom on Fire describes the shifting challenges of global leadership in a world of explosive hatreds and deepening inequalities.